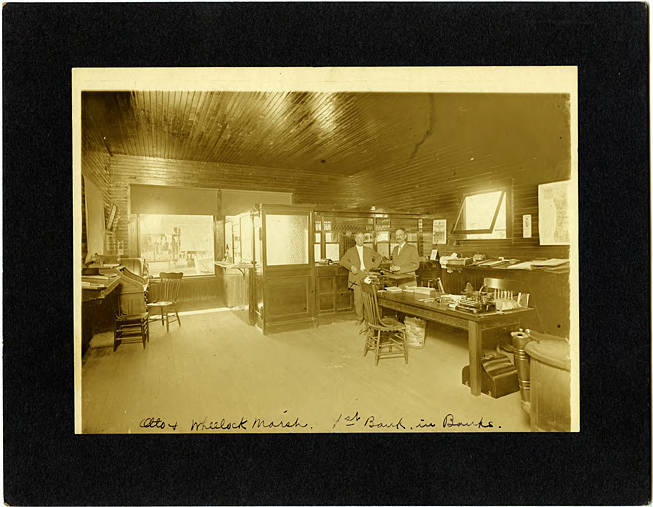 Sepia-toned image of two men standing inside a building with a number of desks and tables. A teller's cage fills the area directly behind the men, separating the entrance from the interior of the bank. Both men wear suit coats and ties. Otto Galaway, bank teller, stands to the image left of Wheelock Marsh, the vice-president. The Washington County Bank opened in 1909; Galaway left in 1921 to open a bank in Vernonia. [front] [ink] Otto and Wheelock Marsh. 1st bank in Banks.